Car Sharing Market size was over USD 1.5 billion in 2017, with fleet size of over 100,000 in the same year. The number of members is forecast to grow at over 20% between 2018 and 2024. Increasing pollution and traffic congestion in urban areas are the major drivers of the car sharing market. With the increasing adoption of these services, people are increasingly opting for soft transportation modes, such as walking or cycling, to the vehicle stations. Roundtrip car sharing vehicles offer about 10% more fuel efficiency, reducing the carbon footprint. Many companies are switching from fossil fuel cars to electric or hybrid cars. For instance, BlueSG offers one-way EV services in Singapore. This program focuses on offering enhanced flexibility and convenience to the customers to enable them to return the vehicles at the destination, instead of the original pickup location. The integration of advanced technologies into the cars to provide enhanced services quality will propel the carsharing market growth. Companies are providing smart cards and RFID tags to enhance security features such as locking & unlocking of doors and providing unique identification to the drivers. For instance, EZrise, a car sharing company based in the U.S., has started providing unique smart cards to its users to lock/unlock the doors of the cars. Car-to-car communication, autonomous driving, and route optimization are some of the technologies that are being implemented by the vendors to attract. The evolution of different mobility models, such as ride sharing, which offers more affordability than these services is one of the major restraining factors for the car sharing market. Strong rivalry from similar transport means, including taxis, on-demand ride services, and auto-rickshaws, that are affordable and easily accessible in developing countries is aiding the market growth. Although the concept of shared cars exists from a decade, there is a lack of awareness regarding this mode of transport and local population prefers to travel/commute with the traditional transport services available in the countries at much cheaper prices. 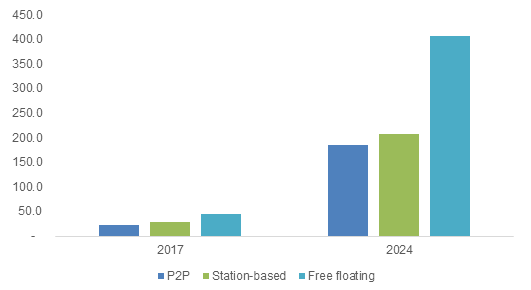 Free-floating car sharing market is expected to gain momentum due to a high degree of flexibility these services offer. These are mainly used for short trips in city/urban areas instead of taxis. With increasing taxi fares, the demand for free-floating services is increasing. Germany-based providers show profitable operations with a turnover rate of about 125 users per car despite low utilization. Station-based car sharing market is witnessing growth despite the lack of flexibility due to a wide variety of fleet they offer. The operators of station-based services provide cars with different models and brands that cater to all needs of the customer. These services are widely adopted in rural areas and small & mid-sized cities. The companies are investing in station-based models as they offer high utilization rates. For instance, Volkswagen invested in station-based models by acquiring 60% stakes in GreenWheels. The inconvenience caused to the customers in returning the vehicle at the designated pick and drop station is expected to drive the one-way car sharing market growth. One-model is projected to gain pace as they reduce the inconvenience for the users to drop-off the vehicle at the pick-up point. These services are flexible and convenient for the customers; however, this model is difficult for the operators. These are difficult to manage due to the imbalance created on the fleet distribution system due to the freedom given to the users to drop-off vehicles at different locations. Car sharing market in business applications accounted for the majority share and are is to remain dominant for the next few years. Several businesses continuously face problems pertaining to creating space for vehicle parking. These problems can be overcome by implementing these services. Rising on-demand mobility among corporate offices is making a positive impact in the society as they are helping in preventing emissions and pollution on a large scale, thus positively impacting the market growth. Corporate carsharing market is expected to gain momentum as it allows commercial businesses to eliminate or minimize the size of private vehicle fleets by offering the employees access to shared vehicles. In addition, ease of operation and flexibility through enhanced mobility will drive the implementation of these services in the business applications. Companies such as Omoove and Ubeeqo provide these services, particularly to the corporates. Germany car sharing market holds the majority share in Europe and is expected to grow significantly due to increasing taxi fares and rising costs of owning a vehicle. According to Bundesverband CarSharing, an association of car sharing companies in Germany, there are currently about 140 service providers in the country. People opt for these services due to the ease-of-use and lower costs that include fuel, parking, and insurance. China car sharing market is expected to grow due to increasing government support at local and central levels. In October 2015, the State Council encouraged the automotive manufacturers to develop and implement these services in the country. In March 2016, the National Development and Reform Commission put forward guidelines to encourage improved credit system for the shared economy. The local governments of Shenzhen, Shanghai, Qingdao, and Beijing are supporting the adoption of services by offering parking lots and adding cars. 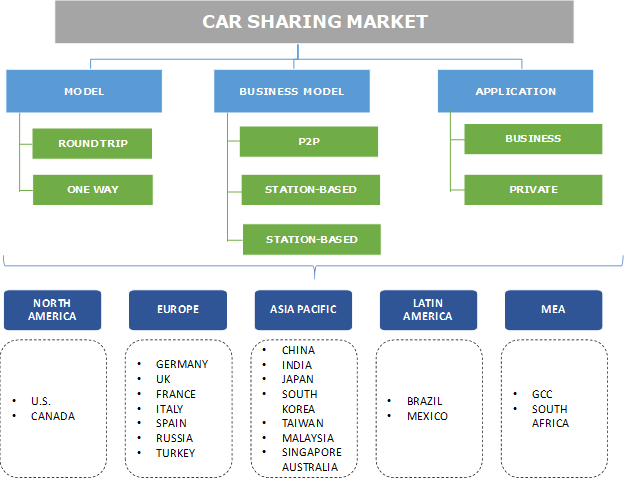 Some of the key stakeholders in the car sharing market include car sharing companies, connected hardware solutions providers, mobility platform providers, private car owners, and end users. Some of the companies in the industry include Hertz Corporation, Autolib, Car2Go, DriveNow, Getaround, Inc., Orix Corporation, and Zipcar, Inc. The industry is fragmented in nature with newer regional players entering the industry. The automotive players are facing constant pressure due to reducing car ownership. This is encouraging them to enter the car sharing industry either by forming partnerships with the existing players in the industry or by establishing subsidiaries that provide car sharing services. For instance, in October 2016, Toyota Motor Corporation announced a partnership with Getaround, leveraging their technology platform to provide peer-to-peer services and enable future mobility services. BMW launched DriveNow, car-sharing services for their BMW-i, SIXT, and MINI series. The industry is witnessing the emergence of competent industry-level bodies that act as mediators between local government authorities and companies. These third-party bodies include CarSharing Association, BCS, and Car Plus. These entities set rules and principles to guide the relationship between the operators and the government. This is expected to stream-line the operations of stakeholders in the car sharing market. Technology is transforming the way of commute and transportation. With technological advancements, the consumers can track, request, and pay for trips using smartphones and e-payment options. The creation of robust mobility network is reducing vehicle ownership and increasing the use of newer and smarter transportation options such as e-hailing, and ride sharing, thus fueling the market growth. Early models in the carsharing market involved the commuters picking up and returning the vehicles to the same location, typically on an hourly basis. Hertz and City Car Share are considered pioneers in the sector. Companies, such as Car2Go and DriveNow, introduced the concept of free-floating car sharing, wherein the vehicles can be picked up and dropped off at different locations, typically charged by the minute. Getaround then introduced peer-to-peer car sharing, which involves the sharing of cars owned by individuals. Services provided by companies such as Zipcar and Car2Go are reducing the demand for new and used vehicles, causing changes such as mass-transit improvements in the society.